Butoh is an avant-garde movement form first performed by Japanese artists Tatsumi Hijikata and Kazuo Ohno in 1959. 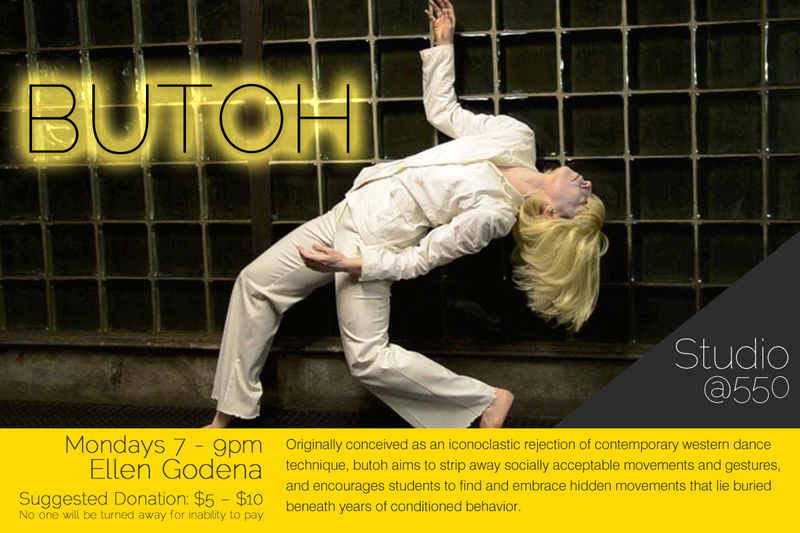 Originally conceived as an iconoclastic rejection of contemporary western dance technique, butoh aims to strip away socially acceptable movements and gestures, and encourages students to find and embrace hidden movements that lie buried beneath years of conditioned behavior. In this weekly, ongoing class we focus on butoh movement methodology, the aim of which is to uncover ‘the natural body.’ Each class begins with a somatics-based warm-up, partnering work to explore skeletal, muscular, and fascial layers of movement and energy exchange, and vigorous floor work. The latter half of each class is spent developing fragile and vulnerable states in the body to explore the “materiality of being.” Image-based poetry is used as grounds for movement generation in brief witnessed improvisations at the end of each class. Dancers at all movement levels are welcome to participate; please keep in mind that classes are very physical. 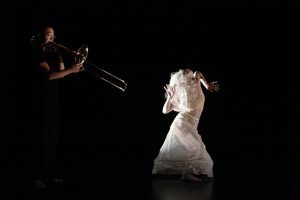 Ellen Godena (performance name, Sara June) is a Boston-based dancemaker, performer, and visual artist who has exhibited and performed nationally and internationally since 1991. Ellen approaches performance as an opportunity to explore what is felt and stored within the body as a record of ongoing experience. Since 2006, she has collaborated closely with sound artist Max Lord as half of the performance duo Lord and June on large-scale, site-sensitive, durational performance works often presented in unique locations. Most recently, Lord and June was commissioned by the Boston University Art Galleries to create a work, PEACOCK, for performance alongside the internationally acclaimed Hiroshima Panels by Japanese artists Iri and Toshi Maruki. Ellen’s work has been presented by the Boston University Art Galleries, Boston University Dance Theater, Boston Center for the Arts, Mobius, Green Street Studios, Rhode Island College, Rhode Island School of Design, Bridgewater State University, the School of the Museum of Fine Arts Boston, REACHFestival at the Wistariahurst Museum, Somerville Artbeat Festival, Berwick Research Institute, the Bumpkin Arts Encampment, the Jonathan Shorr Gallery (NYC), Center for Performance Research (Brooklyn, NY), Le Petit Versailles (NYC), the League of Electronic Musical Urban Robots (Brooklyn, NY), and Le Lieu Centre for Performance en art actuel (Quebec City), among others. Her performances have been chronicled in several publications including This Moment: Missives from Another World, a photographic history of the Boston performance art scene by Mobius photographer Robert Raymond, andIntroduction to Performance Art, an art historical review by the Los Angeles sculptor Robert Fontenot. Her movement language reflects 15 years of intensive study of the butoh form. 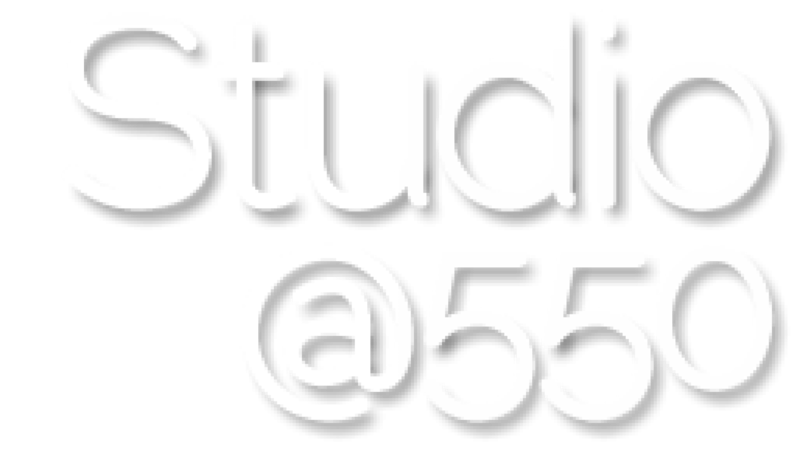 Artistic influences include Japanese and American experimental performance, contemporary movement improvisation, and yoga. Her training lineage includes study with butoh masters Katsura Kan, Hiroko Tamano, Natsu Nakajima, Su-En, Diego Pinon, Vangeline, Deborah Butler, and Jennifer Hicks, body weather artist and teacher Zack Fuller, and Boston-based movement improvisers Liz Roncka and Olivier Besson. She recently completed a 500 hour yoga teacher training with master teacher, Barbara Benagh. Ellen performed as a member of the butoh troupes Kitsunebutoh (BOS) from 2001-2004, and the Vangeline Theater (NYC) from 2006-2008. Since 2009, she has been a member of the Mobius Artists Group. Her academic and research background includes undergraduate training as a visual artist (Rhode Island School of Design) and graduate training in Developmental Psychology (Harvard University), and Clinical Social Work (Boston University).